The Regalian Navy, commonly referred to as the Crown Fleets or the Imperial Navy, is the collective of the Regalian Armed Forces functioning directly under the authority of the Regalian Admiralty. The Regalian Navy is the sole military body responsible for the safety of the Regalian Archipelago, deploying troops during wartimes, and merchant fleet protection when violence is not rampant. The navy itself extends the Regalian Empire protection across the various suzerain states that are subject to the Regalian Commonwealth, and is also used as a means to intimidate or influence independent states. The Regalian Navy is the largest military force on Aloria, while still retaining a very structured organization. The Regalian Navy was established by Emperor Leomar I the First in 70 AC. Prior to the establishment of the Navy, Regalia operated with military forces on the land, and naval construction was still very much in its infancy following the Five Family Rebellion. However, the Berger war against the Bergerland Republic in 70 AC made it abundantly clear that the Regalian Empire was in dire need of a strong fleet in order to project its power to lands that were not connected by a land bridge to the capital, or Anglia, which was considered to be the center of the Empire at the time. Following the defeat of the Bergerland Republic, large sums of loot were spent on expanding the fleet as quickly as possible, which gave rise to wealthy naval commissions and shipyard families. With the wars against the Wirtemcaller Kingdom and the Skagger Horde, the Regalian Fleet became increasingly important with every passing decade, as the Regalian commanders saw the value of naval support to their stretched battle groups which were often many miles apart. The second great fleet expansion followed in 179 AC after the final defeat of the Skagger Horde on Regalian soil. With the flight of the Skaggers to Nordskag, Regalia saw the need to expand its influence beyond the borders of the archipelago and project their military presence into Daendroc, Ithania and the north. The sheer power of Regalia’s fleet was first demonstrated during battle against the Kingdom of Nordskag. Further conflicts with neighboring states as well as the expansion of the Regalian Merchant network saw a huge increase in the quantity of the ships and a deepening complexity of the Admiralty's structure. The final great expansion of the Regalian Navy was shortly before the Chrysant War, in the rearmament period. During the rearmament period, the Imperial Nautknights were first constructed and armed, as cannons were becoming more common, being deployed on Human warships, replacing of the archaic catapults and scorpion crossbows. As the fleet proudly displayed its destructive power against the Allar fleets, it was evident that the, Regalia’s global naval superiority was assured. Conflicts against the Songaskia would later cause the fleet to behave more aggressively, chasing down neutral fleets to pay homage to Regalia or to simply loot them by right of the strongest. In present times, most of the Regalian military has been subjugated to the Regalian Navy -a far cry from the small position the fleet once had as a supporting role to the Army. New regiments like the Tenpenny Army and armies from subjugated states are all brought together under the all-powerful Board of Admirals and the Grand Admiral. The Regalian Navy has access to several different model Regalian warships, state of the art weaponry developed by Regalians, as well as Qadir and Dwarves in service to the Regalian Navy. Over the years, technological innovations have obsoleted older class ships, but general designs have been maintained over the centuries, in belief that raw firepower will win the day. A list is presented below, highlighting the main warship classes as well as basic information on each warship design. Girobaldin Fregat - The Girobaldin Fregat is often used as a reconnaissance vessel, sporting only 16 cannons, but in turn, remaining considerably lighter than all other ships, and thus faster. The Girobaldin shipyards favor smaller, faster ships over the heavier battleships of the north, and as such, most scout vessels are made in Girobalda. In order to captain a Fregat, one would need to have a third rate naval commendation. These are freely available to all permission registries for Army Permissions. Anglian Frigate - Anglian Frigates make up the bulk of the Regalian Navy. These so called light frigates tend to carry around 40 cannons. Despite being called the Anglian Frigate, most of these frigates are produced in Dragenthal, as Anglia lacks moderate shipyards. In order to captain a Frigate, one would need to have a second rate naval commendation. These are freely available to all permission registries for Army Permissions. Calemberg Third Line - Calemberg Third Lines are first responder battleships which favor cunning, offensive, and blitz tactics. The ship is relatively light, but manages to sport 52 cannons. What’s curious about Calemberg Third Line ships is that their wooden parts always look very dark, even in absence of paint, due to the tree material with which these ships are made. In order to captain a Third Line, one would need to have a first rate naval commendation. These are freely available to all permission registries for Army Permissions. Calemberg Second Line - Calemberg Second Lines are the main coastal offense ships that favor troop transport, as well as long range fire capabilities. These ships hardly ever engage in naval combat as they are primarily used for coastal bombardments and naval assault support. Despite being heavier in tonnage than the Third Line, Second Line ships only sport 22 cannons, though of a very heavy caliber. In order to captain a Second Line, one would need to have a offensive naval commendation. These are freely available to all permission registries for Army Permissions. Anglian Nautknight - Anglian Nautknights are the true beasts of the Regalian Navy, providing a terrifying amount of firepower, as it boasts somewhere around 162 cannons,a mixture of heavy and light cannons. Anglian Nautknights are rarely ever deployed unless the Regalian Navy is required to defend a key position since these ships are so large and heavy that they are impractical for chasing enemies down. Nautknights are few in number and rarely produced in the Anglian Great Works, the only drydock large enough to allow construction of Nautknights. In order to captain a Nautknight, one would need to have an Imperial High Command commission, which are often only extended by the Emperor. As such, these require strict approval from the Noble Managers to be incorporated into a character’s backstory. The Regalian Fleet unofficially maintains a number of Northern style raiding vessels, but these ships never see actual combat and are mostly used as ceremonial barges or during military parades. The Regalian Navy is deceptive in its name, in that the armed forces within the command structure of said navy are actually not limited to naval forces alone. In fact, the lower ranks of the Regalian Navy consist of the Tenpenny Army as well as naval marine commissions, which mainly consist of infantry, as well as some cavalry brigades and even artillery experts.The Navy does take a superior stance over these organizations through a complex hierarchy, in the belief that the Navy is always the first responder, and that all ground forces are subject to the Navy’s directives. 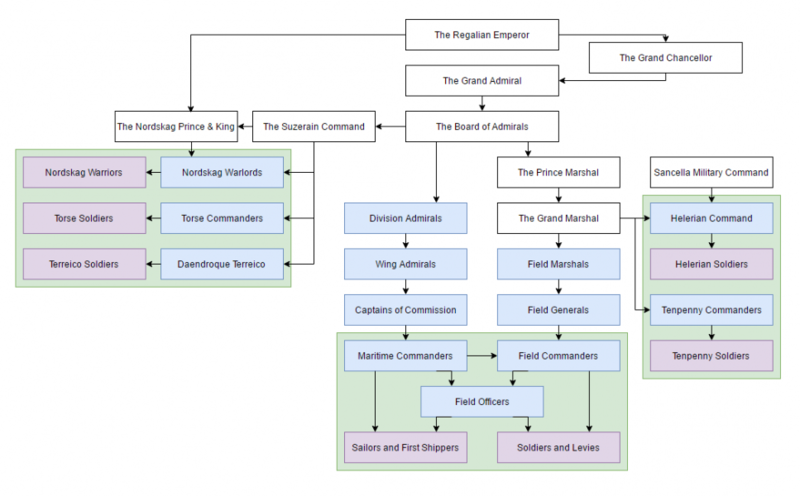 Below is a hierarchy listing the complete Naval Armed Forces. Positions that require no Special Permissions are marked in Purple. Positions that require a Special Permission are marked in Blue. Military Structure. Click to enlarge. Note: Various white marked positions are not available for players through Character Applications or Canonizations. These can only be granted based on special request, and in heavy consultation with the Lore Staff. Nordskag Warriors - Nordskag Warriors are Northerne barbarians that are loosely pressed into the Nordskag Army by the King. Most (if not all) of these troops fall under the School of Skagger, though they cannot progress beyond the level of warrior. Torse Soldiers - Torse Soldiers are soldiers from the Kingdom of Torse that act as the King’s Guard. Due to the disorganized nature of the Torse army, Torse soldiers don’t fall under any Combat School. Terreico Soldiers - Terreico Soldiers are loose bands of Daendroque militia that are paid for their service by Daendrocquin governors. These troop skills fall under the School of Turall, but they can never progress beyond the level of Fighter. Sailors and First Shippers - Sailors and First Shippers are the men who power the Regalian Navy. These troop skills do not fall under any combat schools because they are not combat occupations. Soldiers and Levies - Soldiers and Levies are either smaller House Guards or Levies which are summoned from the peasantry by their feudal overlords. These troop skills fall under the School of Tenpenny, but never progress beyond the level of Fighter. Helerian Soldiers - Helerian Soldiers are the religious guards of the Sancella of Union, which can also be engaged in warfare when the Sancella declares a Holy Writ. These troop skills fall under the School of Lancyon. Tenpenny Soldiers - Tenpenny Soldiers are the only professionally paid troops in Aloria, being a part of the Tenpenny Army. Tenpenny soldiering is a full-time job. These troop skills fall under the School of Tenpenny. Tenpenny soldiers are also mostly Anglian cultured Ailor. Nordskag Warlords - Nordskag Warlords are the Jarls of Nordskag, hereditary positions in the Kingdom of Nordskag. This position can only be gained through the Noble Canonization system. Torse Commanders - Torse Commanders are the aristocracy of the Torse Kingdom, the provincial princes. This position can only be gained through the Noble Canonization system. Daendroque Terreico - Daendroque Terreico are oligarchic military commanders paid by the Daendrocquin Governors to lead the militia. This position can only be gained through the Noble Canonization system. Division Admirals - Division Admirals are Admirals that control a so called division, distinguished as an area of Aloria where they are responsible for all naval engagements. This position can only be gained through the Noble Canonization system. Wing Admirals - Wing Admirals are Admirals that control Wing Fleets, which are collections under ten ships which are on specific missions. This permission can be registered on the Permission registry, but the character should usually be in the range of ages between 40 and 60. Captains of Commission - Captains of Commission are the captains of individual ships which make up the Wing Fleets. This permission can be registered on the Permission registry, but the character should always be at least 30 years old. Additionally, characters never own any ships. They are assigned as captain to specific ships and rotated on duty. Maritime Commanders - Maritime Commanders often accompany Captains of Commission as the commanders in the field for the Levies and Soldiers that are transported by Fleets. This permission can be registered on the Permission registry. Field Marshals - Field Marshals are Military Commanders that oversee an entire continent’s military forces. This position can only be gained through the Noble Canonization system. Field Generals - Field Generals are Military Commanders that oversee provincial movements and commands. This position can only be gained through the Noble Canonization system. Field Commanders - Field Commanders are the Military Commanders that control individual armies not attached to field commands. Four or so Field Commanders serve under a Field General. This permission can be registered on the Permission registry, but the character should usually be in the range of ages between 35 and 60. Field Officers - Field Officers are the individual commanders that order roughly 200 men on the field, usually Soldiers and Levies. This permission can be registered on the Permission registry, though keep in mind that the soldiers are never loyal to their officers. Officers simply get assigned a different number of troops each time they enter the battlefield. Helerian Command - Helerian Commanders are the individual Commanders that oversee the Helerian Soldiers. The Helerian Command is always made up of men of the cloth and members of the Sancella of Union. As such, this permission can only be gained through the Noble Canonization system. Tenpenny Command - Tenpenny Command are the individual commanders that order roughly 500 men in the field all Tenpenny Soldiers. Tenpenny Command is a full-time employment. This permission can be registered on the Permission registry, but the character should usually be in the range of ages between 35 and 60. Characters that have a job in the military are usually part of the military for life unless something happens in roleplay that denies them this position. You shouldn’t make a character with the express purpose of immediately changing their job when it starts becoming an active duty in roleplay. Being a military man doesn’t grant any additional rights in roleplay. Soldiers who are off-duty (which is essentially every soldier in Regalia), do not get any special weapon rights or criminal leniency. All soldiers who are roleplaying in Regalia are always off-duty and will only participate in battles when war is actually ongoing. When war is ongoing, military characters may insert themselves into battles and conflicts in whatever position their permission would realistically allow them to be inserted. As such, these characters always have the right to be included in story progressions that involve the military one way or another. Most Sailors on the Regalian Navy are actually criminals who are pressed into service in exchange for more lenient sentencing. Due to the strict discipline and long deployment times, most criminals fall strictly in line since the Navy has the right to execute deserters on the spot. Various Division commanders often compete with one another over Imperial Glory. Not all military men see eye to eye, as many try to outdo each other and seize military commissions. It is likely that for example Tenpenny soldiers are loyal to one another, but have an ongoing turf war with Nordskag warriors. Respect for higher positions is absolutely crucial in the Navy. Any off or on duty soldier that misbehaves in front or towards their superior is liable to fifteen lashings with a whip by the Bluesteel Order upon the request of the senior officer. 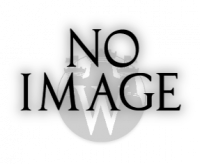 This page was last edited on 2 June 2018, at 09:04.